As we move into summer, farmers are juggling many tasks, including scouting and applying pesticide to emerging crops. Half the battle is keeping track of all the information about what's being applied where, and at what cost; the other half is managing the logistics. Factor in equipment readiness, weather conditions and labour...and now things really get interesting. It can be tempting to throw details out the window and focus on the job at hand. But before that happens, take a few minutes to find out why the time you put in to capture and track herbicide usage is guaranteed to pay off. Every year without fail, the wrong herbicide product gets put on the wrong field with ruinous consequences. According to Terry Aberhart, owner of Sure Growth Technologies and owner/operator of Aberhart Farms in Saskatchewan, with the increase in farm size and the increasingly complex chemical world, it is easy to see how this problem occurs. 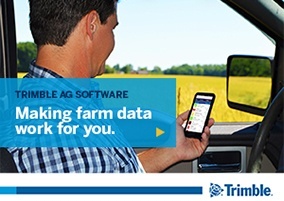 "This is one of the main reasons we are extremely diligent about keeping up-to-date field records in Trimble Ag Software. We manage all our pesticide recommendations through the product recommendation process in that platform. You could still have operator error on the sprayer, but with field maps on the reports and geo-locations through a tablet or smartphone, the risk of this type of mistake is greatly reduced. It's been a 10x improvement for our farm." Recording herbicide applications is useful with drift claims (e.g., wind direction, date, operator, crop stage). For farmers who work with agronomists, these experts will also appreciates knowing when their client sprayed so they can time tissue samples collection and enter fields safely. As all agronomists know, it's very common to see herbicide carryover in all or parts of most fields. But for the most part, the symptoms go unnoticed — a slight stunting, some leaf cupping, a bit of twisting... but at what yield penalty? It's hard to say. Canola is some of the worst hit crops, though Group 2 damage on cereals can be incredibly subtle and usually go without notice. Tracking of herbicide use over time is especially beneficial should there be late changes to cropping plans. It also ensures good herbicide rotation. Populations of herbicide-resistant weeds continue to grow. The likelihood that the development of a new herbicide group as a 'silver bullet' solution is slim. This issue is best managed by the farmer by keeping accurate records and rotating herbicide groups. Here’s where having a record of the past herbicide history could potentially put money in your pocket. Food processors and grain buyers have increasingly added sustainability clauses in contracts saying growers must provide information on pesticides applied. These clauses meet shareholder demand and increase customer transparency. Terry Aberhart, an agronomist who coaches several farmer clients in his area, says, “I strongly believe that most of our clients and fellow agronomists greatly underestimate the value and risk reduction that proper data management can provide. This is by far the highest returning investment per dollar on our farm." While it might seem daunting to get started with tracking herbicide usage, keep in mind that the benefits outweigh the drawbacks! For more tips on tracking and using your farm data to grow profits, check out Trimble's free e-book. 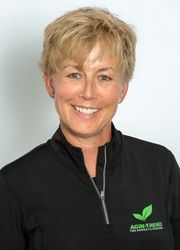 Jill DeMulder is a technical agronomist with the AGRI-TREND Knowledge Team. She works with the AGRI-TREND Senior Agri-Coaches to provide training and research material to assist the AGRI-TREND Agri-Coaches in the delivery of superior science-backed advice to farmers. Why Should I Care About Clean Yield Data?